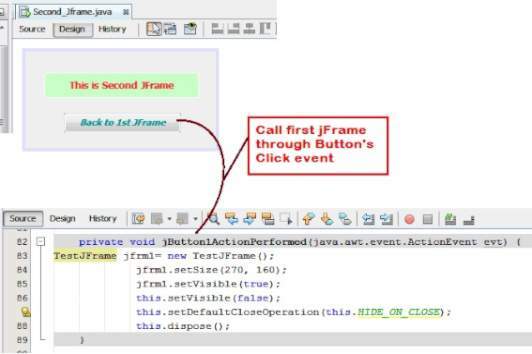 Suppose, we have added two jFrame and want to open another jframe through existing jframe’s button’s click event. Suppose, First is ‘TestJFrame’ and second is ‘Second_Jframe’. Both contains same packages. So the point is, we want to open it through button’s press and back to first through second jframe’s button press. Now, here SKOTechLearn will describe step by step process how to open another existing jframe in java netbeans. First we Design ‘TestJFrame’ through adding some controls like jLabel and jButton. And add some code inside button’s "ActionPreformed" event. As you can see that we have described the code description in above given image. You can copy code from following. After that when you press button to open another one, you have to dispose the existing form when another will opened. Now if you want to back to your first frame, then you have to write code in button’s ‘ActionPerformed’ event as you write in first frame. The steps will be shown in bellow figure. Now follow the steps and copy this code and paste it in desire button’s event or any events from where you want to show. After doing all these process there will be the output present. In this way you can show your static frame, which you have designed and want to show at run time with one click. For dynamic frame visibility, you can use the code as described beneath. In Dynamic process, you have to set the location, size etc through code as mention above. 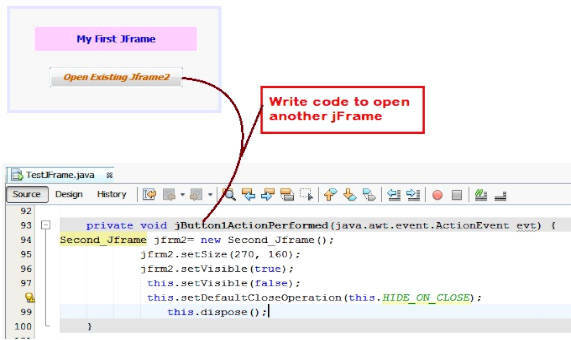 Now you can understand how to show dynamic or static jframe in java etbeans. I hope this post will helps you to implement the development process. SKOTechLearn explains everything with details and deep way for better understanding. So, the process of How to open another existing jframe in java netbeans has been completed.